Of all the tuning processes, waxing is probably the most rewarding that you can learn to do yourself at home. And if you’ve already equipped yourself with the life skills necessary to iron a shirt without burning the house down, you should get on fine. As opposed to doing base repairs or tuning the edges of your skis, there isn’t too much that can go wrong; although if you do want to make repairs or tune your edges, you will need to do that before you wax. Waxing nourishes and cleans the bases of your skis, and provides a protective layer that will help prevent minor scratches. So regular waxing can really help to extend the lifetime of your skis, and there’s no such thing as over-waxing. Oh… and it allows you to go faster (and hit harder). Waxing is very simple: you melt a hot layer of wax onto the skis, so that it penetrates the porous material of the bases. Once cooled, the wax is then scraped off and buffed so that all you’re left with is the wax that has penetrated and nourished the bases, as well as a microscopic layer on the surface of the skis. But first you need to remove any of the dirt, oils and grime that have built up of your bases, so that you have a fresh, clean surface to work with. You can buy base cleaners to do this, however depending on what material your skis are made of, some people believe that these can be too harsh. Base cleaners also tend to remove any wax that you did had left on your bases, which isn’t ideal. For my part, I simply start with a solution of warm water and a little mild washing-up liquid. Clean the bases of your skis with a soft sponge and allow them to dry fully before you start waxing. The best method for cleaning your bases is a hot wax scrape. This is basically an initial wax cycle, except that the wax is scraped off before it has had time to cool. This allows you to pull out any dirt and oils that were embedded in the bases, while also nourishing the skis. To start, you will need an iron and some soft wax. Universal wax also works fine. You can buy specific waxing irons, but any old iron will do (small travel irons are great). Just don’t go ironing your best shirt with it afterwards. Set the iron to a medium-hot heat (the melting temperature of your wax should be written on the packaging) and hold the wax against the hotplate. The wax should start to drip off the iron. If it doesn’t, turn the heat up a little. IF THE IRON STARTS TO SMOKE OR THE BASE OF YOUR SKI STARTS TO BUBBLE AT ANY POINT, STOP IMMEDIATELY AND TURN THE IRON DOWN. Once you’ve got a steady trickle going, follow the contour of your ski and then gradually fill in the space inside, so that the area is covered evenly. You don’t need a huge amount. Once you’ve done this, place the iron on the base of your ski and, working slowly from tip to tail, run the iron evenly over the ski several times, without ever stopping in once place. You should have a puddle of wax form behind the iron as you pass. Once the wax is fully melted into the base of the ski, hold your plastic scraper at a bit of an angle away from you and scrape back the wax along the length of the ski. It should start to come off in even shavings, like anaemic Parmesan. Don’t fear the scraper: you need to keep going until you’ve scraped off all the wax. Once all of the wax has been scraped off, you can begin structuring your bases. You can buy brass or nylon brushes from most ski shops to do this, or some structure pads. If you’re looking for a budget solution, some Scotch-Brite works fine as well. There isn’t much to say about structuring, just brush like hell – again, working from tip to tail. This process removes the wax that you couldn’t scrape off and shapes the texture of the fine layer of wax that is left behind so that your skis glide perfectly over the snow. If you’re happy that your bases are now nice and clean, you can start your final wax. If you found that there was still a lot of dirt coming up from you skis during the hot wax scrape, just repeat the process again. The final wax cycle is done in the same way as the hot wax scrape, except that this time around you will want to leave the wax to cool fully for about 20-30min before you scrape it off. You can either use a universal wax for this or a temperature specific wax, depending on the conditions where you are skiing and the time of year. If the weather conditions are varying a lot, stick to something fairly universal. Once you’ve scraped back all of the wax, you can structure the bases again, like before. 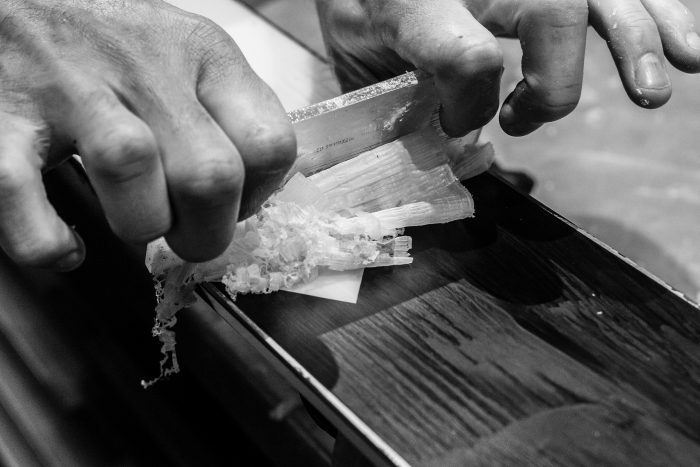 On the final wax, structuring is particularly important, as this will be the finished surface of the skis. You can’t structure too much: the more you brush, the faster your skis will go. For extra speed on cold, hard-pack snow you can finish your skis off with a horsehair brush. If you’re going to be skiing on softer, slushy snow, then stick to a coarser finish with a brass or nylon brush.